PHOENIX (May 10, 2018) —Thanks to a $750,000 donation from The Bob & Renee Parsons Foundation, the Southwest Center for HIV/AIDS will now offer a “Test & Treat” program that will be the first of its kind in Arizona. The gift will enhance the agency’s already strong testing capabilities and provide additional resources for immediate treatment. The approach is aligned with the World Health Organization’s policy aimed at cutting HIV transmission by suppressing the virus in those carrying it, and in turn, decreasing their likelihood of passing it on to others. Since 2012, the Foundation has awarded more than $11 million to the Southwest Center through multiple grants, including the creation of The Parsons Center for Health and Wellness. “Placing those who test positive for HIV on treatment early in their diagnosis, providing immediate access to both medications and behavioral healthcare, will help ensure that the virus is suppressed, undetectable and less likely to spread. This is an essential part of the fight against this disease. We sincerely appreciate the continued generosity and commitment from The Bob & Renee Parsons Foundation to help end the HIV epidemic in Arizona,” says Kristin Kalla, executive director for the Southwest Center for HIV/AIDS. The program builds on the Southwest Center’s existing services since the agency provides more HIV tests, and identifies more HIV positive individuals, than any other community-based organization in Arizona. The HIV Test & Treat program will increase the Center’s capacity to scale-up in-house medical care, including same-day medication prescriptions to those individuals who test positive. These services will be integrated into existing linkages to care, medical case management, behavioral health, pre-exposure and post-exposure prophylaxis, AHCCCS insurance navigation, nutrition services and targeted community outreach initiatives. The Southwest Center has signed and is committed to the United Nations’ UNAIDS 90-90-90 initiative with the goal of achieving the following targets by 2020: 90% of people living with HIV diagnosed; 90% of diagnosed people on antiretroviral treatment; and 90% of people in treatment have full viral suppression. Having HIV testing and care under one roof helps reduce the barriers to immediate care that those who are newly diagnosed with HIV often experience. It will be a critical contribution to the success of the City of Phoenix’s 90-90-90 Fast Track Cities Initiative aimed at ending AIDS as a public health threat in our community by 2020. Phoenix is the 10th city in the United States to sign on to the 90-90-90 initiative, and agency Executive Director Kristin Kalla is on the mayor’s ad hoc committee helping create action plans to achieve each of the initiative’s components. The Bob & Renee Parsons Foundation offers support to nonprofit organizations successfully working to empower, educate, nurture and nourish people during what is often the darkest times of their lives. Founded in 2012 by the philanthropists and business leaders Bob and Renee Parsons to provide hope and life-changing assistance to the country’s most vulnerable populations, The Bob and Renee Parsons Foundation offers critical funding at critical times to those in need. The Foundation’s giving is driven by the core belief that all people—regardless of race, roots, or economic status—deserve access to quality healthcare, education, and a safe place to call home. Follow @WeDealInHope on social media or visit TBRPF.org, to learn more about partner organizations and the important work being done in the community. 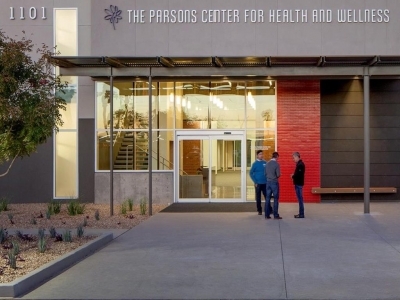 Southwest Center for HIV/AIDS (www.swhiv.org) is located in downtown Phoenix at the Parsons Center for Health and Wellness, alongside Avella, an HIV specialty pharmacy, and the McDowell Medical and Dental Clinic, which provide care services to HIV-positive individuals. The Center provides prevention, testing, education, medical case management, linkages to care and navigational services, community outreach, family support services, behavioral health services, and health & wellness programs including, alternative therapies, primary medical care, nutrition services and an on-site vitamin shop.